When Jazz at the Lobero brings French guitarist and violinist Dorado Schmitt to the stage next week the occasion will mean irresistible swing and supremely melodic improvisation by the legendary string man and the rest of his quintet. Of course, swinging and ‘singing’ are marks of any good jazz artist. 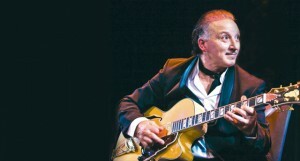 But Schmitt’s “Gypsy jazz” spells more—a living extension of the European continental jazz of Django Reinhardt dating back to the 1930s. Guitarist Reinhardt’s own genius was ignited by the sounds of American trumpeter Louis Armstrong, which then found expression through the French “Musette” café music and the traditional Roma sensibility of his roots. Quintette du Hot Club de France, headlined by Reinhardt and violinist Stéphane Grappelli, became an international sensation, with Grappelli and Reinhardt gaining the approbation, and sometimes sharing the stage, with American legends like Armstrong. The most prominent exponent of America’s new music in the Europe of his time, Reinhardt blasted preconceptions about the guitar, and made records that powerfully influenced modern guitarists from Jimi Hendrix to George Benson. Schmitt, like Reinhardt, is of Romani stock. Born four years after the death of the latter, he came of age learning the rock guitar licks of Carlos Santana and Hendrix, until his father made the suggestion, “Listen to Django, and you will understand.” Today, sporting a Clark Gable pencil mustache—like Django—Schmitt looks as if he’s magically materialized from the frames of an old Hollywood romance. This entry was posted in Music and tagged Carlos Santana, Django Reinhardt, Dorado Schmitt, George Benson, gypsy jazz, jazz manouche, Jimi Hendrix, Louis Armstrong, Musette on October 27, 2014 by joemiller.